Personalized Status, Custom Sounds etc. The new version Messenger Plus! Live 4.90.392 is now compatible with Windows Live Messenger 2011 Final. · Skinning: comments enclosed in "/* */" are now supported in style files. · Once the installation is completed succesfully, a web based 'Thank you' page will be launched. 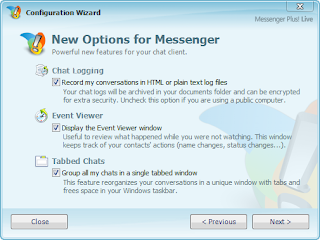 · Once the uninstallation is completed succesfully, a call is made to Messenger Plus! servers for statistical purpose. · Skinning is now supported in Messenger 2011 with the exception of custom window shapes. · Skinning: UIB files can all be properly decoded and re-encoded (windows definitions and styles can be skinned). · Skinning: resources from new locations are now extracted from Messenger.